Darling Spuds come to you from the creators of Salty Dog, Judy and Dave Willis. Salty Dog was conceived as a quirky range of feisty flavoured crisps named in honour of their enthusiastic junior partner, a little terrier puppy called Ruby. 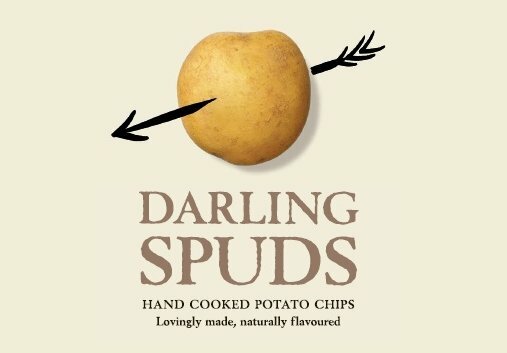 Darling Spuds is the result of Judy's determination to create a more wholesome, all natural snack to satisfy the growing demand for healthier food. Aside from their slightly obsessive interest in snacks, Judy and Dave enjoy a simple, country life. They are renovating a narrow boat called Merlin on the Grand Union canal in leafy Buckinghamshire and enjoy flying kites or walking Ruby in the Chiltern Hills. We could ramble on about our potato selection policy, our high tech slicers and cookers, our meticulous hand cooked frying and our sweeping selection of hand picked natural ingredients but we wouldn't want to bore you. 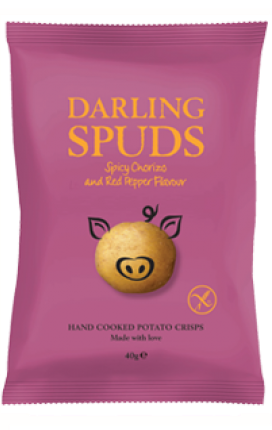 Suffice to say our spuds are lovingly looked after from the moment they arrive at our front door to the moment we pack them off to the big wide world, securely clad in their witty and eye-catching packaging. 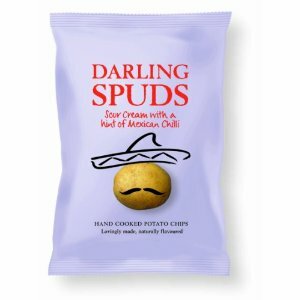 These are delicious, authentic chips with wholesome characters and fiesty flavours, borne out of our potatoes enjoying a well-grounded upbringing. Not only are our chips handcooked but also gluten free, vegetarian friendly, completely free of any unsavoury GMO's and 20% lower in fat than standard crisps.